Citation Information: J Clin Invest. 2007;117(12):3786-3799. https://doi.org/10.1172/JCI32285. The molecular mechanisms of acute lung injury resulting in inflammation and fibrosis are not well established. Here we investigate the roles of the IL-1 receptor 1 (IL-1R1) and the common adaptor for Toll/IL-1R signal transduction, MyD88, in this process using a murine model of acute pulmonary injury. Bleomycin insult results in expression of neutrophil and lymphocyte chemotactic factors, chronic inflammation, remodeling, and fibrosis. We demonstrate that these end points were attenuated in the lungs of IL-1R1– and MyD88-deficient mice. Further, in bone marrow chimera experiments, bleomycin-induced inflammation required primarily MyD88 signaling from radioresistant resident cells. 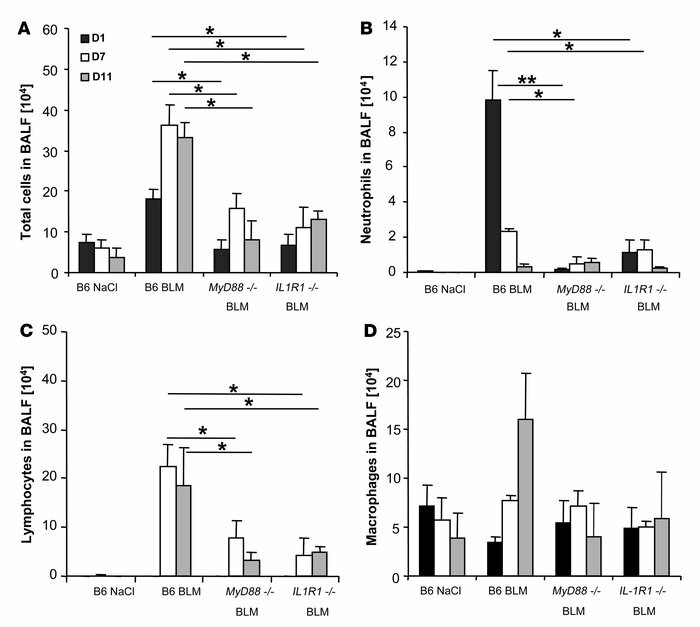 Exogenous rIL-1β recapitulated a high degree of bleomycin-induced lung pathology, and specific blockade of IL-1R1 by IL-1 receptor antagonist dramatically reduced bleomycin-induced inflammation. Finally, we found that lung IL-1β production and inflammation in response to bleomycin required ASC, an inflammasome adaptor molecule. In conclusion, bleomycin-induced lung pathology required the inflammasome and IL-1R1/MyD88 signaling, and IL-1 represented a critical effector of pathology and therapeutic target of chronic lung inflammation and fibrosis. Reduced neutrophil and lymphocyte recruitment in the bronchoalveolar space of BLM-challenged MyD88–/– and IL-1R1–/– mice. (A) Total cell counts were augmented at day 1 in BLM-treated WT (B6) mice (15 mg/kg i.n.) and further increased at days 7 and 11 after BLM administration in WT mice, but less so in MyD88–/– and IL-1R1–/– mice. (B) Neutrophils were recruited into BALF in WT mice within 24 hours, persisted over 7 days, and normalized on day 11, while only few neutrophils were detected in the absence of MyD88 or IL-1R1. (C) Lymphocytes were found in BALF at day 7 and persisted until day 11 in WT mice and were less prominent in MyD88–/– and IL-1R1–/– mice. (D) Alveolar macrophages were augmented at day 11 in WT but not MyD88–/– or IL-1R1–/– mice. Data are from 1 experiment representative of 3 independent experiments (n = 4 mice per group; *P < 0.05; **P < 0.01).